"A delicious, savory brunch braid made with chicken sausage, veggies, and blue cheese!" Heat olive oil in a skillet and cook and stir apple-chicken sausage, sweet potatoes, celery, red onion, red bell pepper, and garlic in the hot oil until vegetables are cooked through but not soft, about 15 minutes. Transfer to a large bowl and season with salt and black pepper. Stir grape halves into sausage mixture. Mix cream cheese, blue cheese, and rosemary in a bowl. Place sheets of puff pastry onto a large baking sheet. Use a rolling pin to flatten the puff pastry sheets and join them along a long edge into one large sheet. Starting with a long edge, use a sharp knife to cut strips into pastry about 1 1/2 inches apart and 3 inches deep. Repeat cutting strips into the opposite long edge, leaving a fringe of cut pastry strips on each opposite edge and an uncut wide strip of pastry in the middle. Spread filling evenly down the uncut center of the pastry sheet; drop spoonfuls of blue cheese mixture over the filling. Braid the pastry by lifting a left and right pastry strip, crossing the two strips over the filling, and twisting one time to join. Repeat braiding the pastry all down the roll, crossing opposite pairs of strips over the filling and twisting one time. Sprinkle the pastry with sliced almonds. Bake in the preheated oven until the filling is hot and the pastry is golden brown, about 30 minutes. 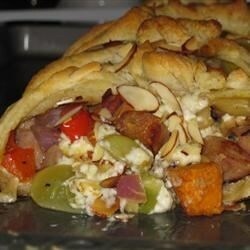 So many different flavors that all work really well together: sweet potatoes, grapes, red peppers and blue cheese! Two out of three of my children love this braid. I used refried beans and halfed all of the seasonings and it turned out delicous!